I'm so, so excited to share this with you! When I pinned this headboard a long time ago, it was one of those "it'd be cool, but we probably won't actually do it" kind of pins. Well, this past weekend, we actually did it! I love the coordination with the new bedding. Like a quilt, it's certainly not perfect, but that's another thing that makes it great! It's relatively easy to make. The most difficult thing is using the staple gun! You can handle that, right? You could even do it in more subtle colors. Imagine some neutral tones or all solid fabric. Sounds pretty too! Note: these instructions are for a queen size bed. 2 sheets of plywood (4ft x8 ft is what we bought I believe; the original post says to use 1/4 inch but we used 3/8 inch). Update 12/28/12: I actually had a yard and 1/3 of two of my fabrics and 1 yard of the other two fabrics. Thanks to a commentor below for catching that mistake! Cut one sheet of plywood to measure 60"x40" You could even do less than 40 on the second measurement if you need to. My plywood ended up showing a little on the bottom. Cut 40 8"x8" pieces of plywood. Thanks so my husband and dad for cutting all the plywood for me! Cut 40 8"x8" pieces of foam. Cut 40 8"x8" pieces of batting. Cut 40 12"x12" pieces of fabric. 2) Glue a piece of foam on top of that (just enough so it doesn't slide around). Make sure the foam's not overlapping too much-you can trim it if need be. 3) Add the batting. You can glue this a little too. 5) Pull the fabric over the edge of the wood and tight on one side. 11) Repeat steps 8-10 for the side opposite the one you just completed. 12) On the remaining two sides, pull the fabric tight and over the edge of the wood until the fabric is smooth on the side. Staple in place. Repeat that process until you have 40 patchwork pieces. Arrange your pieces in the pattern you'd like. I went for a random look. Normally, I go for order and patterns and things being all lined up, but this was an adventure, so random it was! I managed to not take pictures of the next steps...oops! Let me know if you have questions, but I'll try to explain. Flip all your pieces face down while maintaining your pattern (I put a sheet down so I was sure they wouldn't get dirty). Line up the pieces carefully (we lined up the wood edges) and tape them together. 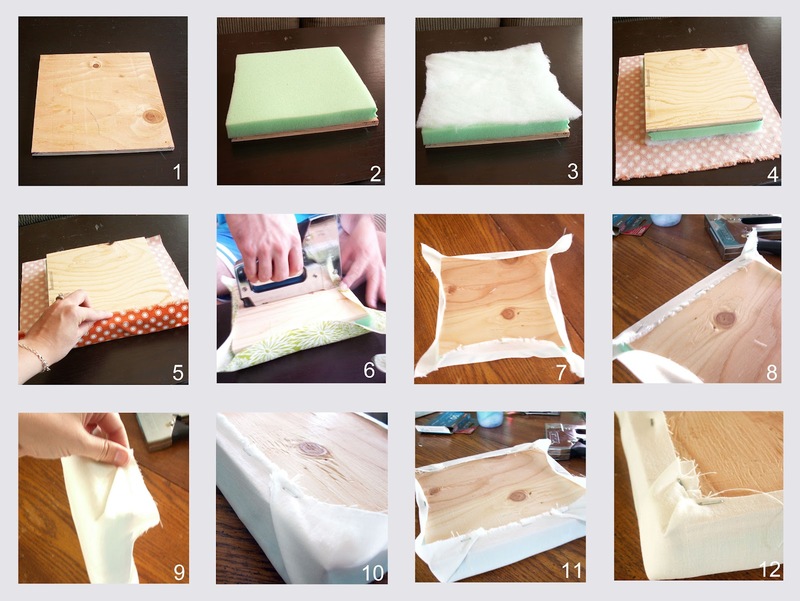 Place your large piece of plywood over the patchwork pieces and screw them together at 8 inch intervals so that you get a screw in each patchwork piece. Hang that baby on the wall! And enjoy your new headboard! I love this! Definitely going to give it a try. Thanks for the tutorial! I love this!!!! It's so pretty! Holy cute, this turned out perfect! Love how it could match any color scheme... now to pick some colors! Looks fabulous and I love the fabrics you used! Things looks really great! A lot of work I'm sure, but it's awesome! Great job! You should link this up at my first LINK PARTY also! Erin, this turned out so, so cute! I love the random pattern and I absolutely love the cheery color combination. I am very impressed. Have a great weekend! 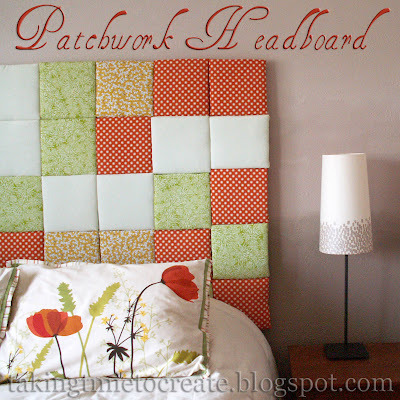 Thank you so much for sharing your beautiful headboard on A Crafty Soiree! This week kicks off our September Celebration, marking a year of weekly Crafty Soiree parties. I'm excited to let you know you're project will be featured in this week's party post along with a giveaway from Shabby Apple! Please come and check out your feature, it will be up tonight after midnight EST. 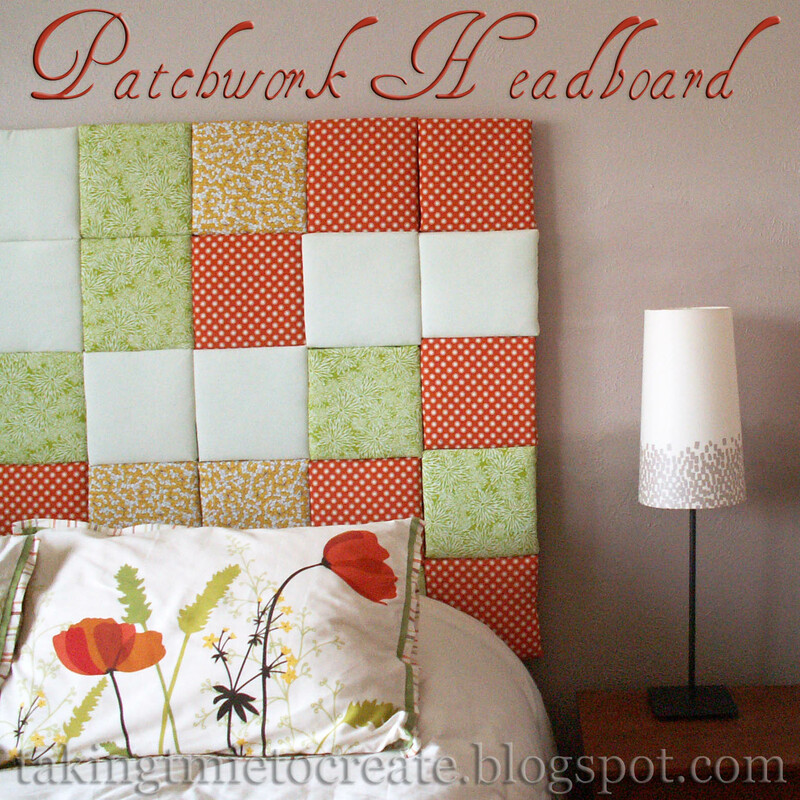 This is such a neat headboard! You have a lot of patience to put it all together! I LOVE, LOVE, LOVE this! Did I mention that I LOVE this! I'm so going to do this in my daughter's room. I love the color scheme you chose too. Great tutorial. Thanks so much for sharing at Creative Thursday. Have a wonderful week Erin. What an adorable idea! Super cute! Thanks so much for stopping by and leaving the sweet comment about Lee's caramel frosting. My FIL doesn't really care for chocolate either. I think that is why this is his favorite frosting. It is really good on white or yellow cake too. Have a great weekend! This is a fantastic project Erin. I am spotlighting it tomorrow morning. :) Have a nice day. Wow! This is so beautiful and impressive! 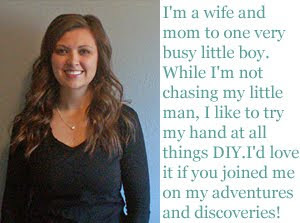 Thanks so much for linking up to our Pinteresting Link Party! Your awesome project is featured this week :) please grab an I have been featured button..
That's aweosme, pinning this! Love it! That's amazing, love it! Come check out my new crafty blog, just started it- eek! Question about the fabric amount from a fabric novice, you said you used 4 yards of fabric. I'm thinking a yard of fabric is 3ft x 3ft giving you 9 sq ft in each yard. 4 yards at 9sq ft per yard is only 36 squares yet you say you had 40...can you help me understand so I get the right of fabric?? Thank you for finding that mistake! You are correct that you could only get 9 squares from a yard of fabric. I went back and counted my squares, so I could figure out what I did...I actually had about a yard and a third of the orange fabric, because there are 12 orange squares. The white fabric was wider that fabric typically is, so I was about to get 10 squares out of that. There are 9 squares of the green and yellow fabrics, so I only had a yard of those. So the long and short of it is that you'll need to get a yard and a third of each fabric if you want the same number of squares for each color. Fabric typically measures 45 inches across (some is even wider at 60 inches across), so a yard and a third will typically give you 45x48 inches...more than enough to cut ten squares. Thanks, again for finding that mistake! How did you attach these to the wall?/board? All the pieces are attached to a piece of plywood using screws. Then we attached ring hooks to the plywood to hang the whole thing on the wall. We moved about ten months ago, and some of the squares were coming loose, so we just screwed the whole thing to the wall and reattached the loose pieces using some heavy duty double-sided tape. Sorry, for the delayed response. If you have any more questions, please email me at takingtimeinthecity@gmail.com as I no longer actively blog here. Thanks for the question!